Finally available on DVD for the first time, EMI/New Door Records/UMe are proud to announce the eagerly awaited release of the Double Disc DVD of Live After Death, the legendary recording of Maiden’s four night stand at Long Beach Arena, California, in 1984. In the stores February 4th, 2008 (Worldwide) and February 5th (U.S.), the release will coincide with the start of the band’s Somewhere Back In Time World Tour on which they will recreate many of the aspects of this original and spectacular show. 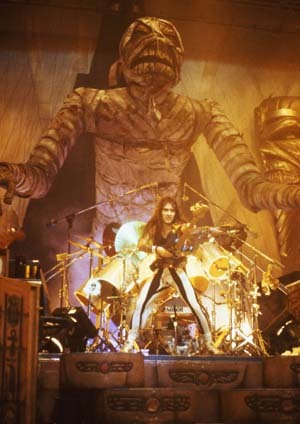 Disc two has Part 2 of the History Of Iron Maiden, continuing on the Maiden story from The Early Days DVD, along with rare and unseen bonus footage in the form of Behind The Iron Curtain, Rock In Rio ’85, And ‘Ello Texas, all in all giving a total running time of well over three hours. Plus of course the photo galleries, relevant promo videos, artwork galleries, tour dates, tour program and other features which all combine to make Maiden DVDs a very special and utterly comprehensive treat for their fans. 1. The History of Iron Maiden – Part 2 (60 mins) – Documentary. 2. Behind the Iron Curtain ( 57 mins approx) Documentary and Live – shot during Maiden’s historic tour of Poland and other parts to the Eastern Bloc in 1984 featuring interviews, live and offstage footage capturing the atmosphere of this remarkable journey behind the Wall at the height of the Cold War. ‘Aces High’, ‘2 Minutes To Midnight’, ‘The Trooper’, ‘Revelations’, ‘Powerslave’, ‘Iron Maiden’, ‘Run To The Hills’, ‘Running Free’. 4. ‘Ello Texas – 15 minutes – Interview and live. Caught by a film crew in 1983 at the Alamo and sound checking their show in San Antonio. Live After Death was filmed and recorded towards the tail end of ‘The World Slavery Tour’ over a record breaking four sold out nights at Los Angeles’ 13,200 capacity Long Beach Arena. 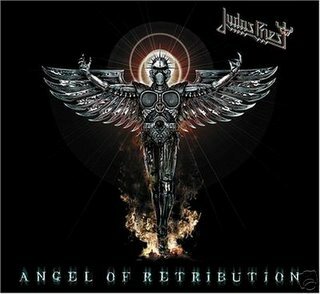 Featuring tracks from their first five albums both the album and video topped the international charts around the world. The tour opened in Warsaw in August 1984 and concluded in Los Angeles July 1985. It covered 193 concerts in 21 countries, including an incredible 112 arena shows in just the USA and Canada (both where the album went Platinum), and saw the band playing to over a million fans in North America alone. This was the most ambitious, longest and most grueling tour Maiden ever experienced. As the second installment to 2004’s international chart topping The Early Days DVD The Second Disc features the highly anticipated The History Of Iron Maiden Part II which gives an insight, humorous and otherwise, into the making of the record as well as exploring the creativity and the background pressures created through the sheer hard work and the physical toll that comes with success at this level for a touring band. Behind The Iron Curtain, which was first released in April 1985 as a 35 minute video documentary, illustrates the quite remarkable story of how Iron Maiden became the first major band from the West to play large arenas in Poland, Czechoslovakia, Yugoslavia and Hungary at a time when these markets were still very much “Behind the Iron Curtain”. This 57 minute DVD version features a lot of extra footage not included on the original retail release. Prior to this DVD the only time it had been seen was on a special MTV airing in 1984. With complete access on the tour, filmmaker and director Kenny Fueurman, gives the viewer a candid insight into the world of Maiden at this groundbreaking time in their career. It also contains interviews with some of the thousands of fans who attended their shows, and their reaction to having Maiden play there for the first time despite their album being out of reach in the old Eastern Bloc countries, where at the time it would cost almost a month’s wages! Also included is the infamous incident of the band gate crashing an unsuspecting private wedding party and becoming the evenings ‘entertainment’ in return for a Polish vodka or three! Extensive research allowed the producers to retrieve footage of highlights from the band’s biggest ever show when they played in Brazil to a sea of rock fans estimated to be somewhere between 250,000 to 350,000 on the first night of the first Rock In Rio festival in February 1985. Maiden went on just prior to headliners Queen and cemented their place in the heart of South American fans. Despite best endeavors this 50 minutes clip of extremely rare concert footage is admittedly not in the greatest shape and in parts was beyond repair, but at the request of fans hungry for a record of the historical performance, it has been included in the package as a special bonus. Another small but also previously unavailable 15 minute feature is ‘Ello Texas, which gives a candid glimpse of Iron Maiden performing to the US audiences with further band interview footage at the Alamo. Historically this recording from 1983 should have been included In 2004’s Early Days DVD but it only came to light during research for this Live After Death DVD and is included now for interest. 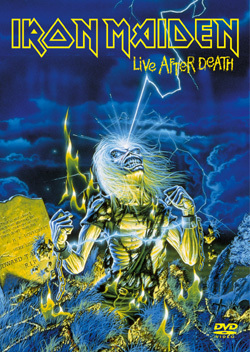 In essence, Live After Death, the double disc DVD gives over five hours of content, giving the most complete and in depth exploration of Iron Maiden during what was considered their most pivotal album and tour of their long and distinguished history. The February 5th DVD release coincides with the start of the recently announced Somewhere Back in Time World Tour 2008 which opens in India at the beginning of February.